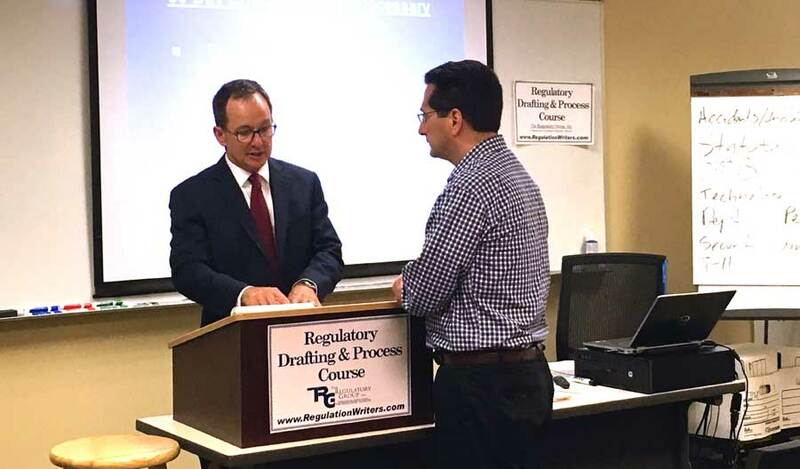 The Regulatory Group, Inc. (TRG) has current continuing legal education (CLE) approval from the State bars of California, Pennsylvania, and Virginia. Over the years many State bars have approved TRG courses for CLE credit and no State bar has denied an application for credit for any of TRG's courses. Attorneys from States that do not have a current approval can apply for approval on their own and request reciprocity from their State bar based on accreditation by California, Pennsylvania, or Virginia. All attorneys, except those from Pennsylvania, are responsible for submitting the required information to their State bar to receive CLE credit. As an accredited provider with the State of Pennsylvania, TRG will submit CLE credit documentation to the Pennsylvania State Bar on behalf of Pennsylvania attorneys who attend TRG's courses and sign the CLE sign-in form. For copies of accreditation forms for Virginia and California or for other information about receiving CLE credit please send us a message here. To learn about the mandatory CLE requirements for your State, click here to go to the American Bar Association's Mandatory CLE webpage.